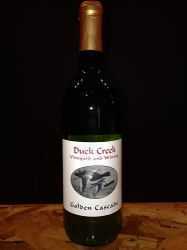 Duck Creek Vineyard & Winery is a small boutique winery established in 2013 and located just 15 minutes southeast of Green Bay, Wisconsin with easy access off Interstate 43. Our first grapes were first planted in 2006, expanding our vineyard with additional grape vines in 2011,2014, and 2016 to include popular wine grapes such as Kay Gray, Concord, Delaware, Catawba, Marechal Foch, Marquette and Brianna. Fruit Wines such as our Black Cherry Noir (a Double Gold Winner at last year's state fair), Blackberry (which won FIrst Place and Best of Show), Watermelon Crawl (a tasty blend of watermelon and Merlot to win a 2nd place finish at the State Fair), and Razzin’ (another 2nd place finish made with sweet ripe raspberries and white Zinfandel). We also feature Kombucha Tea, a healthy refreshing tea with all natural probiotics and detoxifiers the Chinese have referred to as the "elixir of life" for over 1000 years. A Wine Tasting Bar where visitors can sample our award winning wines. Make your own wine at U-Vin for as little as $7.10 per bottle! Select a wine you'd like to make and we'll provide everything you need and help you prepare the juice, then you can return to pick up, bottle, cork and label your 28 bottles of wine. Winery and Vineyard Tours available upon request. We invite you to visit our vineyard, winery and wine shop, or to browse our online store where you can find our many fine wines and other products. See a list of our retail locations here. Call 920-863-2104 or contact us today!! Page Summary: Duck Creek Vineyard and Winery , within minutes of Green Bay, features winery tours, wine tasting & the best Wisconsin wine (including fruit, white and red wine) as well as kombucha tea and mead honey wine for Appleton, De Pere and nearby Manitowoc. We also offer wine making kits and classes using our wine making equipment for wine lovers from Oshkosh, Sheboygan and Fond Du Lac, as well as Outagamie, Fond du Lac, Sheboygan, Manitowoc and Winnebago County communities.